See the best of Eastern Europe on this exhilarating Balkan adventure. Your cruise vacation begins with two overnights in the lively Hungarian capital of Budapest. Board your ship and head south, enjoying guided sightseeing in each city, including inside visits of Kalemegdan Fortress in Belgrade, the eclectic rock formations of Belogradchik, Tsarevet’s Fortress in Veliko Târnovo, and Arbanassi’s Ethnographical Museum and Church of the Nativity. Whether you’re seeing the sights, shopping for handcrafted embroidery or Herend porcelain, or basking in the coffee house culture over a rich cream cake in the renowned Gerbeaud Café, Budapest’s unique energy is positively palatable. On your included GUIDED TOUR of the city, see Heroes’ Square as well as the massive hilltop castle complex with its remarkable Fishermen’s Bastion and 11th-century Matthias Church, the coronation spot of several Hungarian monarchs. Be sure to take note of the city’s eight bridges—many famous sights in and of themselves—which connect ancient Buda on the right bank with Pest on the left. You may even want to walk across Chain Bridge, built in 1849 and a symbol of Budapest. This afternoon is free. Perhaps visit St. Stephen’s Basilica for marvelous city views from its viewing platform, or stroll along Váci utca, the main shopping street. This morning you can explore this vibrant city at your own pace. Shop at the Great Market Hall and purchase paprika or embroidery at one of its 180 vendor stalls, or wander around the Royal Palace grounds. This afternoon, board your river cruise vessel and meet your crew at a welcome reception. This morning, enjoy some leisurely cruising before arriving in Mohács, the last stop in Hungary. After lunch, an included excursion takes you to Pécs. Established by the Romans in the 2nd century, this was a flourishing and important town for Christianity by the 4th century. These early Christians left behind many underground burial chambers with memorial chapels above ground. With a Local Guide, visit the UNDERGROUND TOMBS—now part of a UNESCO World Heritage Site—many of which have splendidly decorated murals with Christian themes. Later, enjoy an ORGAN CONCERT. Pécs is also a rich showcase of Turkish architecture and home to Turkish mosques, striking churches, and an enjoyable atmosphere around its restaurants and cafés. One of the oldest cities in Europe, the capital of Serbia is situated at the confluence of the Danube and Sava Rivers. A LOCAL GUIDE will be proud to show you its main sights, including St. Sava, the world’s largest orthodox church. Also visit the city’s principal landmark, KALEMEGDAN FORTRESS, which showcases the history of Belgrade. Built in stages between the 1st and 18th centuries, the fortress witnessed many battles and observed the courage of those trying to defend the city from conquerors. The surrounding park is the most beautiful and largest park in Belgrade. In your free time, be sure to check out the city’s lively pedestrian area and charming outdoor cafés. This morning, dock at Donji Milanovac, where a short drive takes you to the impressive LEPENSKI VIR EXHIBITION CENTER, which houses area archaeological artifacts and from where you have unique views of the Danube Gorge. Return to your ship before lunch, then cruise what must surely be the most spectacular scenery of the dramatic IRON GATES gorge, a narrow and formerly very dangerous passage dividing Europe’s Alps in the northwest from the Carpathians in the southeast and forming a natural border between Serbia and Romania. Vidin is an important Danube port in northwestern Bulgaria. Its medieval FORTRESS, known as “Baba Vidin,” is the town’s primary landmark. It served as Vidin’s main defensive installation during the course of the Middle Ages and is the only entirely preserved medieval fortress in the country. It is now a fortress museum and has been restored to its former appearance. In nearby Belogradchik, view the eclectic group of ROCK FORMATIONS on the western slopes of the Balkan Mountains. Sculpted by natural elements for more than 200 million years and with a variety of sizes and shapes, the Belogradchik Rocks are spectacular! 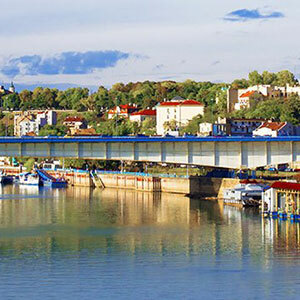 A comfortable ride from the river port of Rousse is the ancient Bulgarian capital of Veliko Târnovo. Situated on three hills surrounding the Yantra River, the city was a natural fortress with ancient stone houses clinging to the steep slopes. One of the oldest towns in Bulgaria (dating back to 4300 BC), the oldest part is Tsarevets Hill, home of the ROYAL FORTRESS, and the Patriarch’s Church. With your LOCAL GUIDE, discover this town that played an important role in Bulgaria’s history. Next, journey to Arbanassi, founded in the 15th century, and best known for its Bulgarian Revival architecture and ETHNOGRAPHICAL MUSEUM, a 400-year-old house preserved as a museum. Visit the CHURCH OF THE NATIVITY, one of the town’s oldest churches, and see its outstanding collection of frescoes. Return to your ship in Rousse, Bulgaria’s largest inland port. If you don’t wish to participate in the full-day excursion, stay on board and relax or join a GUIDED TOUR of Rousse. After breakfast say goodbye to your crew. Bucharest, Romania’s lively capital, is only a short drive from Oltenita. Its wide, tree-lined boulevards and Arc de Triomphe—built in 1922 to honor the bravery of Romanian soldiers who fought in WWI—have gained it the name “Paris of the East.” Much recent history has taken place in the city. During the INCLUDED TOUR this afternoon, see the main sights including Royal Palace Square, the scene of riots in 1989, which led to the collapse of the communist dictatorship. In your free time, discover this interesting city even further. Stroll down Calea Victoriei, “Victory Avenue,” Bucharest’s most historic and alluring street. Initially built in 1692, today it is lined with shops, museums, churches, restaurants, cafés, and fine houses. Visit the captivating Lepenski Vir Archaeological site. Few would argue the InterContinental Budapest is in the city’s best location: right on the Danube across from Castle Hill and the Royal Palace. With the Chain Bridge and the Parliament just steps away, there’s no shortage of superb sightseeing opportunities. The Váci Utca shopping street, Central Market Hall and the Gellért Baths are also nearby. Explore Bucharest from the glorious Athenee Palace Hilton Bucharest hotel, one of the city’s most sophisticated and prestigious landmarks. The hotel is conveniently located in the heart of the city and enjoys views of Revolution Square and is close to Bucharest’s many local attractions. Hungarian Countryside Experience with Wine Tasting Enjoy a genuine countryside experience only 30 minutes away from the capital. Stroll through the stunning vineyards of Etyek, enjoy the fascinating landscape of the youngest and the fastest developing wine region of Hungary. Visit two small, family-run wineries; learn the secrets of winemaking from the local winemakers. Sample three top quality wines in each cellar along with tasty Hungarian snacks. You will leave with a really intimate understanding of the traditions and people that make the wines here so special. Dinner at Belgrade’s Skadarlija District Once home to many Serbian poets, writers, artists, and actors, the cobblestoned Skadarlija (or Skadarska) street today hosts some of the best restaurants in town, all of which strive to preserve Bohemian traditions from the early 19th century. Definitely the place to go if you want to get a feel of the atmosphere of Belgrade’s bygone times, and taste the best of local food. Live music will provide that extra touch of atmosphere while you chat and dine in pleasant surroundings. Included drinks and hassle free transport by coach is provided. Serbian Countryside Step back in time into the lifestyle and traditions of old Europe, as you visit the scenic rural region of northern Serbia, in an area called Vojvodina. Start your countryside tour by visiting the private Honey Museum. The region is also one of the oldest viticulture areas in Europe where grapevine has sprouted on Mt. Fruska Gora’s fertile hills for over 1,700 years, ever since it was first planted by Roman Emperor Probus. Enjoy a wine-tasting in a local wine cellar. Sremski Karlovci is located where the wooded slopes of the Fruska Gora meet the Danube. A guided tour will reveal the beauty of this once important town, where for the last hundred years history seems to have passed it by. Enjoy a 4 course lunch in a local restaurant with included wine and soft drinks, before admiring the idyllic views of rolling green pastures, typical European farmland scenery and golden haystacks along the way to Belgrade, Serbia’s energetic capital city. The Romanian Parliament – the Second Largest Building on Earth The ultimate dream of former Communist Leader of Romania Ceaucescu, this Palace of Superlatives is a breath-taking example of communist dictatorship’s omnipotence, rarely seen anywhere else. Admire countless halls, hundreds of crystal chandeliers, amazing carpets and learn on the spot about man’s latest effort to create something that would last for more than a thousand years. There is nothing like it anywhere else in the modern world and this inside visit remains an absolute must for every Bucharest visitor. Save $600 per couple on Air Fare if you book by February 23, 2016!